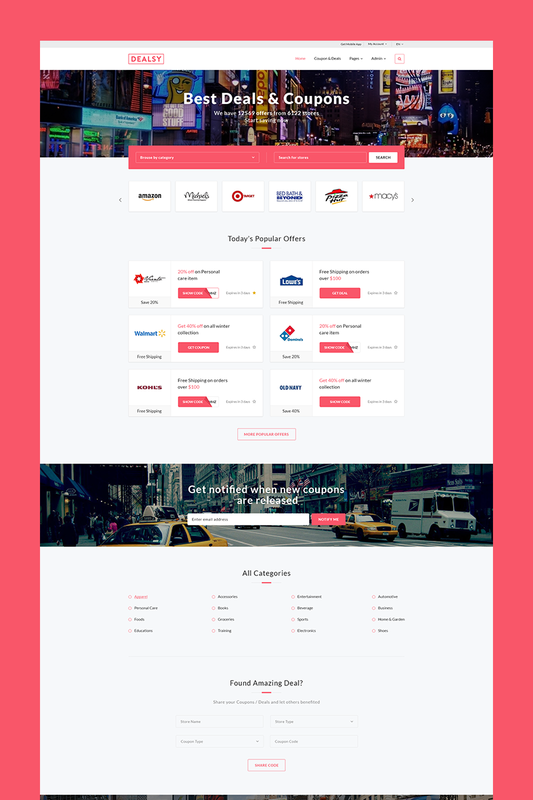 Dealsy is a responsive, clean and modern HTML Bootstrap template to create amazing deals, discounts or coupons website. Dealsy is designed to showcase Coupon code, Discounts, Offers and Deals. This template also includes Admin dashboard. This template is very responsive, fast and easy to use for both customers and back end users. Promo code pop up opening speed is also lightning fast. One can easily convert it also into wordpress theme with some extra effort. As a developer this template has saved me lot of time and headache as most of the code aligned in a most effective way. I am finding this template very lite and there were no bugs. This template help me to accomplish and archive my goal. Thank You!